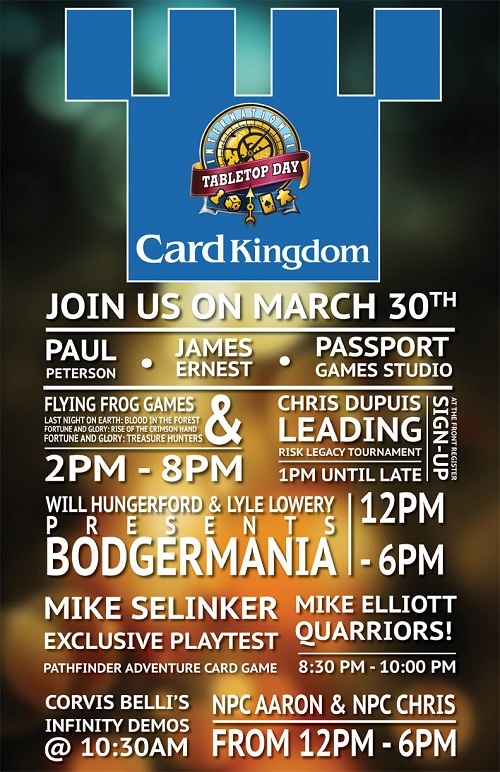 Wil Wheaton and the fine folks at Geek and Sundry have declared March 30 to be Tabletop Day. The Tabletop website has a map of events, including many in Seattle, but I’m going to list them here as well for convenience. I’ll keep this post updated as a receive new information. Just randomly stopped by Gamma Ray Games in Seattle to harass them into doing a #TabletopDay event! They already had one on the books! More events as I learn of them. I will be out and about that day, though I don’t yet know where. If you are interested in gaming with me — and perhaps receiving a tutorial on one of the games you’ve purchased through my Good Gift Game Guides — let me know in the comments, by email, or via Twitter, and I’ll keep you in the loop. You totally know this conversation took place.